From 1984: KNIGHT RIDER: THE 24-CARAT ASSASSIN, the fourth and (as far as I know) final book in the run of paperback episode novelizations. This is an adaptation of the second season two-parter ALL THAT GLITTERS aka MOUTH OF THE SNAKE. These doubled as a back-door pilot for a potential series, CODE OF VENGEANCE, which suffered from a messy birth and very swift death. 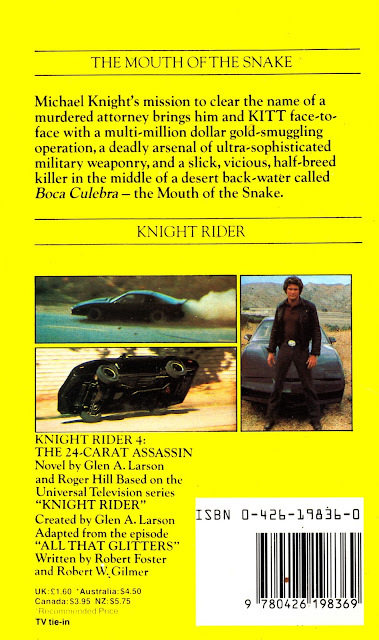 A second, retooled, tele-flick (CODE OF VENGEANCE) aired to some success in the summer of 1985 and NBC went ahead and commissioned a weekly series. Which was canned, before any episodes actually aired, after four outings. In the KR episode, Dalton (played by Charles Taylor) is a government agent who crosses paths with Michael Knight. For the subsequent outings he was a drifter (and obligatory Vietnam Vet). 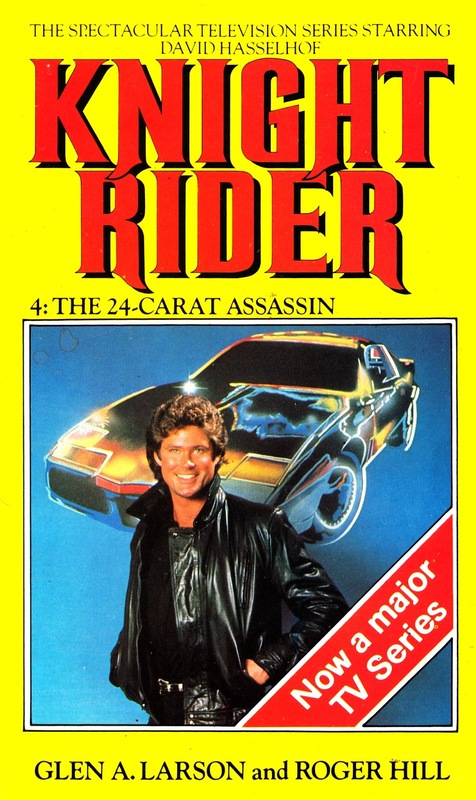 KNIGHT RIDER is no stranger to spin-offs and revivals but this remains the only contemporary one... and the least well remembered. There is a fifth novel in this series of novels, It is called "Knight Rider 5 Mirror Image". It is a direct novelization of the season 2 two hour/two part story "Goliath"